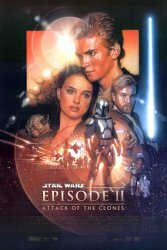 Synopsis: Ten years after the events of The Phantom Menace, the galaxy has undergone significant change, and so have familiar heroes Obi-Wan Kenobi (Ewan McGregor), Padmé Amidala (Natalie Portman) and Anakin Skywalker (Hayden Christensen). They are thrown together again for the first time since the Trade Federation invasion of Naboo, and Anakin has grown into the accomplished Jedi apprentice of Obi-Wan, who has transitioned from student to teacher. The two Jedi are assigned to protect Padmé, whose life is threatened by a faction of political separatists. As relationships form and powerful forces collide, these heroes face choices that will impact not only their own fates, but the destiny of the Republic. Employers To Lose Millions For Episode II? Star Wars: AOTC TV Spots Online! Boyband N'Sync In Episode 2? Three more treats in November! First Episode II Trailer Online! Three Episode II Trailers Coming! Exclusive! : Star Wars Episode II Pictures! From the official Star Wars magazine! We've got the direct links to the footage!